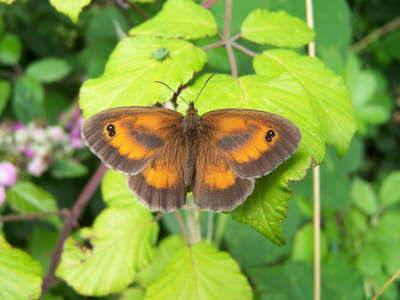 The events were attended by Butterfly Conservation Ireland and Belfast Naturalists’ Field Club. 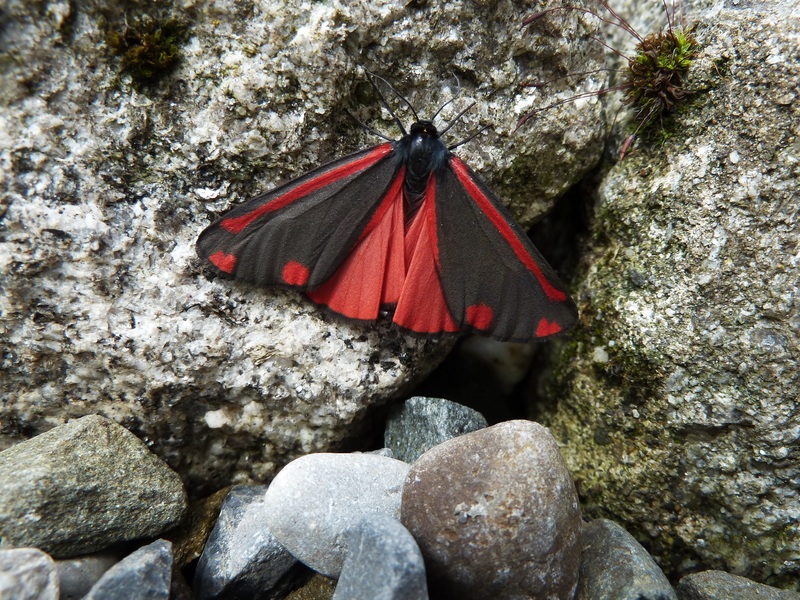 The moth morning led by Philip Strickland was held at Lullymore Heritage Park followed by the butterfly walk led by Jesmond Harding which took place in Lullymore West and Lullybeg. The previous night was dry, calm and warm, a perfect combination for moths. The five traps held good catches, especially the larger Robinson traps. The full species list is awaited, but highlights include Gold Swift, Goat Moth, Northern Eggar, Pebble Hook-tip, Grass Emerald, Large Emerald, Birch Mocha, Lilac Beauty, Barred Red, Waved Carpet (a scarce species), Northern Spinach, Eyed Hawk-moth, Poplar Hawk-moth, Elephant Hawk-moth, Beautiful Snout, Scarce Silver Y and Burnished Brass. A great many photographs were taken by field club members who were very interested by the enormous range of the moths’ colours, patterns and shapes. Moth study is fascinating, even if one never gets beyond enjoying their physical appearance, especially the painstaking intricacies of their patterns. The moths were released after the photos and their day-flying relatives were examined. A lovely female Meadow Brown showing delightfully intense orange fore-wing markings posed very nicely for the photographers. Often seen as a less glamorous species, this was certainly an arresting beauty. 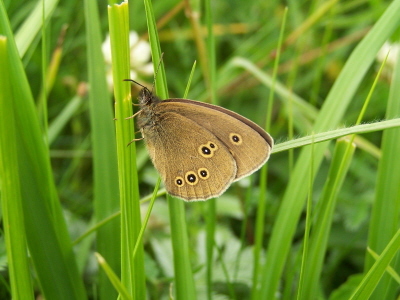 Ringlets bobbed along the wayside grasses following us as we made a stroll to the rich grasslands at Lullymore. 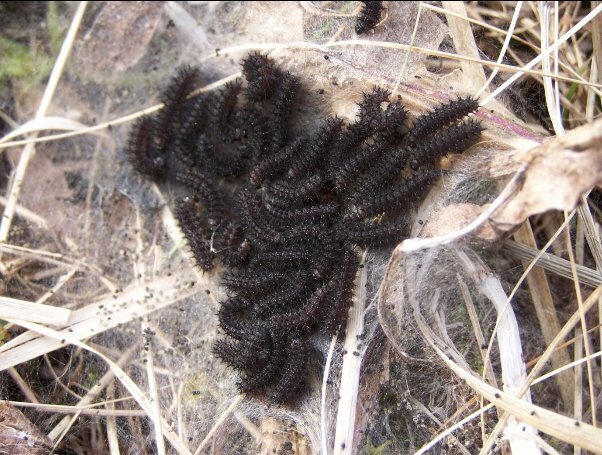 Marsh Fritillary eggs were seen on the underside of a large leaf of the food plant, Devil’s-bit Scabious. These have turned purple-brown, having been laid about a week ago. Their parents are no longer alive, but have left us with the next generation in egg form. Common Blues fluttered their shining, tinfoil blue wings above still yellow Common Bird’s-foot-trefoil flowers, while a myriad of marauding dragonflies made their direct linear flights and hairpin-bend turns. One snatched a Birch Mocha which it dispatched immediately. The species seen included Four-spotted Chaser, Black-tailed Skimmer, Brown Hawker and a single male Emperor. Later, Dark Green Fritillaries dashed across our path and vanished as swiftly. These restless, shining orange jewels leave one breathless at their glowing colour and exhilarating movement. It is a pity, though, that they rarely allow a close view. 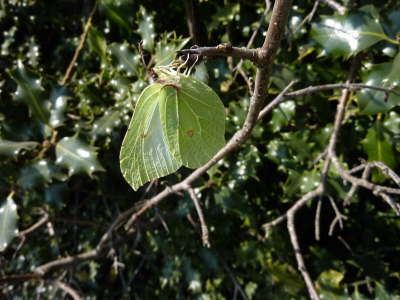 Near the end of the track connecting Lullymore and Lullybeg, where the two buckthorn trees grow together, a faded Brimstone arrived, still laying her eggs. We netted her for a close view to find her wings perfectly in order, after an adult life-span of over ten months. She was released and resumed her egg laying almost immediately. There was one mystery. 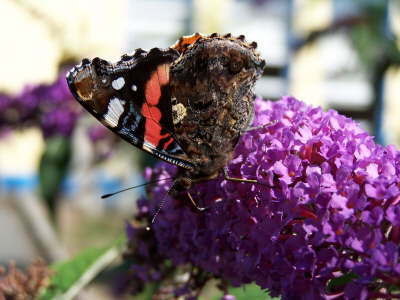 A large, dark butterfly was observed, fluttering around the tops of birch trees. If seen in Europe, it might be expected to reveal a Camberwell Beauty or Purple Emperor. But it did not descend, and the mystery of its identity remains. A special thanks to the large number who attended and showed great enthusiasm for nature’s wonders. It was a lovely experience for all. On the morning of June 22nd 2018 this lovely male Dark Green Fritillary emerged from its chrysalis low down in the vegetation on Lullybeg’s Crabtree Reserve. 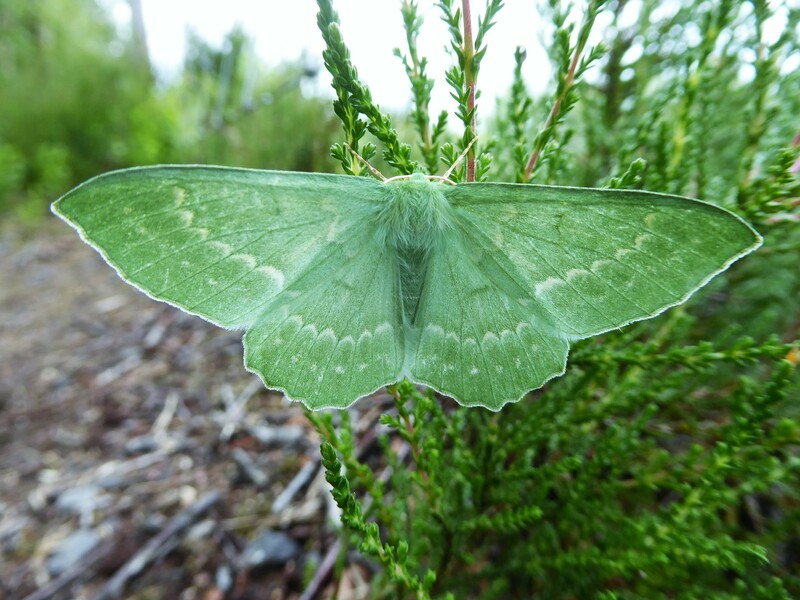 The butterfly is named for the green suffusion on the underside of the hind-wing. This stunning butterfly is a very powerful flyer, even in areas exposed to strong winds. Unfortunately, it is extremely difficult to approach, especially in hot weather. 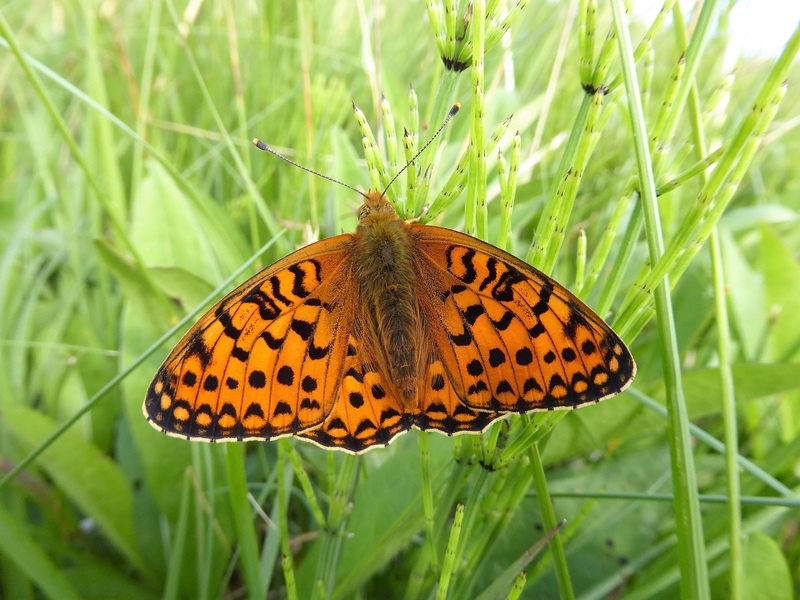 The status of the Dark Green Fritillary on the Red List of Irish Butterflies 2010 is vulnerable because of a population reduction that is projected or suspected to be met in the future (up to a maximum of 100 years) based on a decline in the area of occupancy, extent of occurrence and or habitat quality. The key threats are loss of coastal habitats to erosion and golf links and a reduction in quality of remaining habitats which are suffering from the encroachment of invasive species, because these areas are no longer grazed and are left undisturbed. The encroachment of scrub on limestone, heaths and bogs is a threat to it on these habitats, as is tree planting (usually of conifers) on cutaway and cutover bogs. 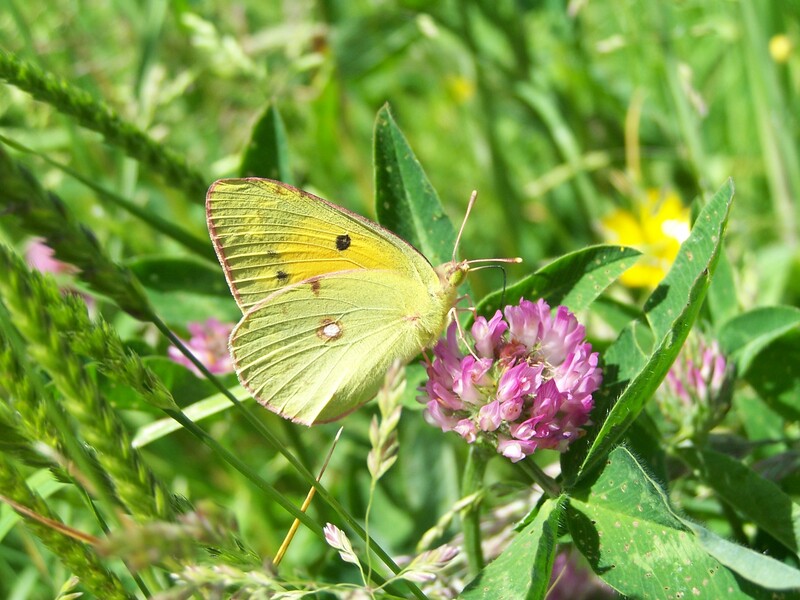 Destruction of limestone pavement and high quality calcareous grassland are sinister threats to this dynamic and handsome butterfly. The species was formerly common on the cutover bog in Lullybeg. Sadly, about ten years ago it became very scarce and almost disappeared from the Lullybeg area. Steps were taken to make the habitat suitable for this magnificent species. Common Dog-violet is the main larval host-plant. The plant was largely absent from the open grassland on the reserve and the violets that exist on the reserve had become shaded by developing scrub and woodland. Heavy shade means that the violets are unsuitable for the larva. To create conditions suitable for the species, violets were planted in clumps on the open grassland. Invasive scrub with violets growing underneath was cut back manually or removed with Bord na Móna’s assistance using heavy machinery. This brought the violets back into the light. The grasses returned which provides cover and basking areas for the larva. The well developed woodland areas with violets within them were left undisturbed as this habitat is used for breeding by the Silver-washed Fritillary butterfly. 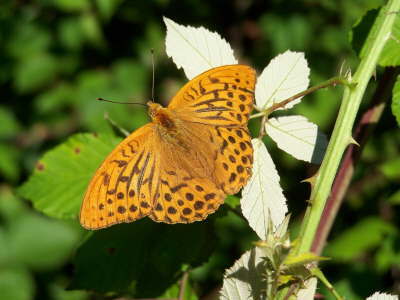 The Silver-washed Fritillary also uses Common Dog-violet as the larval host-plant but its larva requires some shade for it to develop. This approach highlights the need to manage a site sensitively; actions taken to benefit a species should not damage or remove habitat for another, unless an urgent priority exists in favour of a highly endangered species. Retention and maintenance of a range of habitats is best practice especially when a large site is available for nature conservation. The next step was to reintroduce the butterfly. A small number of adult butterflies were obtained from a large population and these were released into the habitat in 2016. 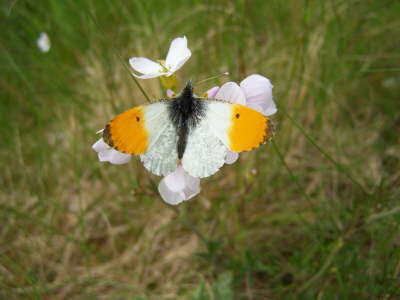 Breeding was suspected in June 2017 when a female was observed on a patch of violets. This deep orange butterfly perched on fresh green vegetation is a glorious sight on a sunny June morning, and it is heartening to see its return. Hard toil is rewarded! 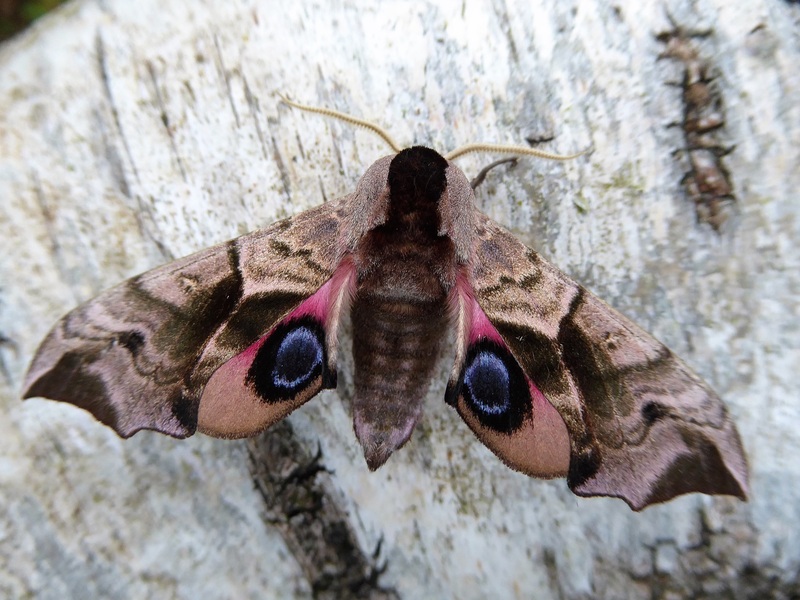 Although most of our moths are night flyers, including some of our most spectacular species such as the sumptuous Elephant Hawk-moth there are some beautiful species flying now. Here are five eye-catching day flyers. All five feed on flower nectar so you can obtain a close view of the animal. 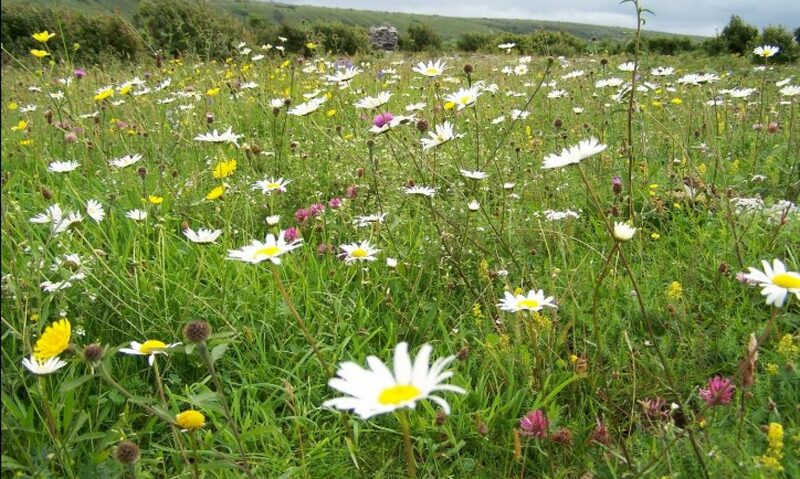 All five live in flower rich habitats and can be seen in bright sunshine. 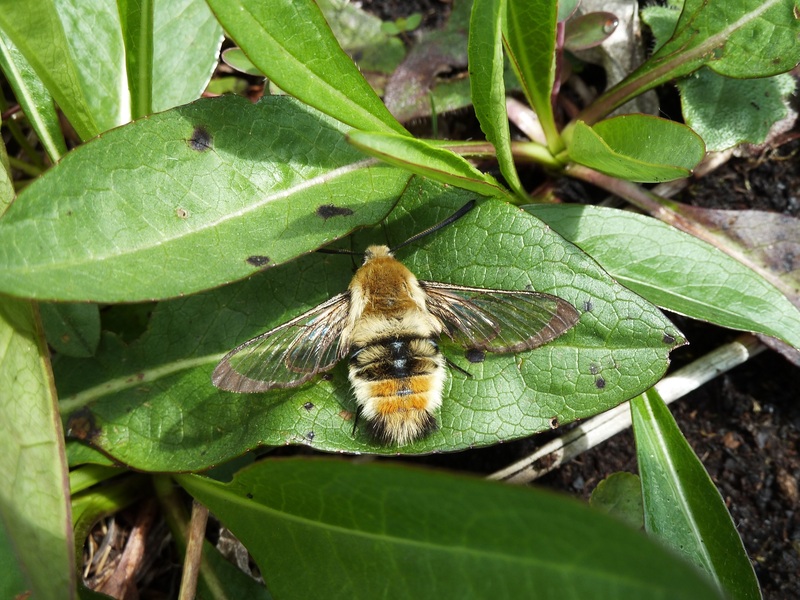 The Narrow-bordered Bee Hawk-moth is a bee mimic and breeds on Devil’-bit Scabious. It flies in May and June. It hovers as it sups nectar from Common Bird’s-foot-trefoil, Ragged Robin and other flowers. It buzzes like a bee too but does not sting! 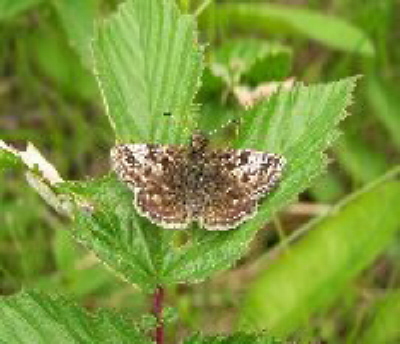 It is often found on the same sites as the Marsh Fritillary. The lovely green and purple larvae feed singly on the host-plant and are seen from June to August. 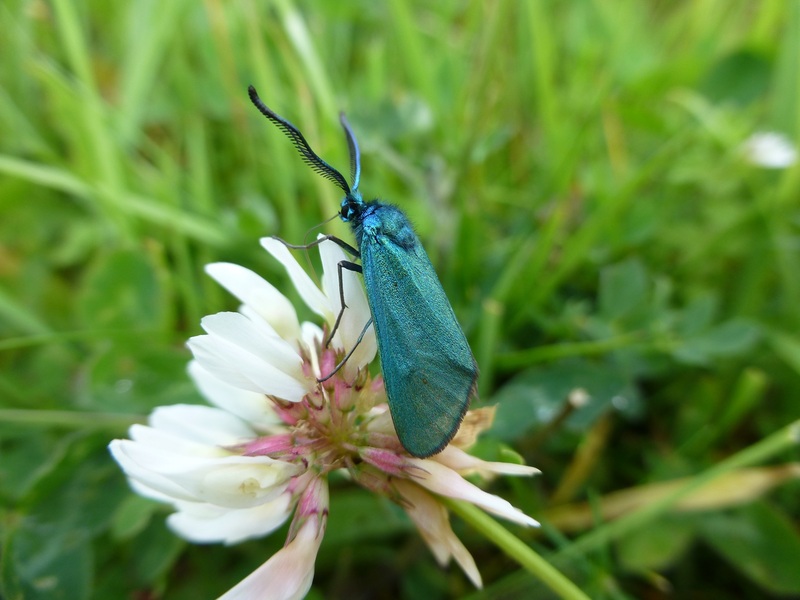 This little moth is often initially seen as a shimmer of gleaming, iridescent green but it soon settles, usually to feed. 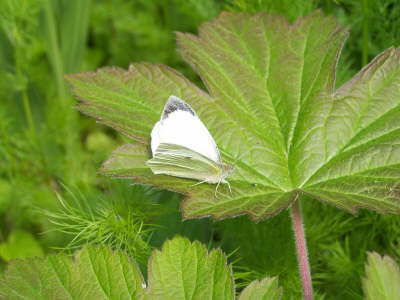 The larvae feed on Common Sorrel but despite the abundance of the plant this moth is uncommon but widely distributed. It is sometimes seen in small numbers in a small area of high quality habitat but I usually see just a single individual. 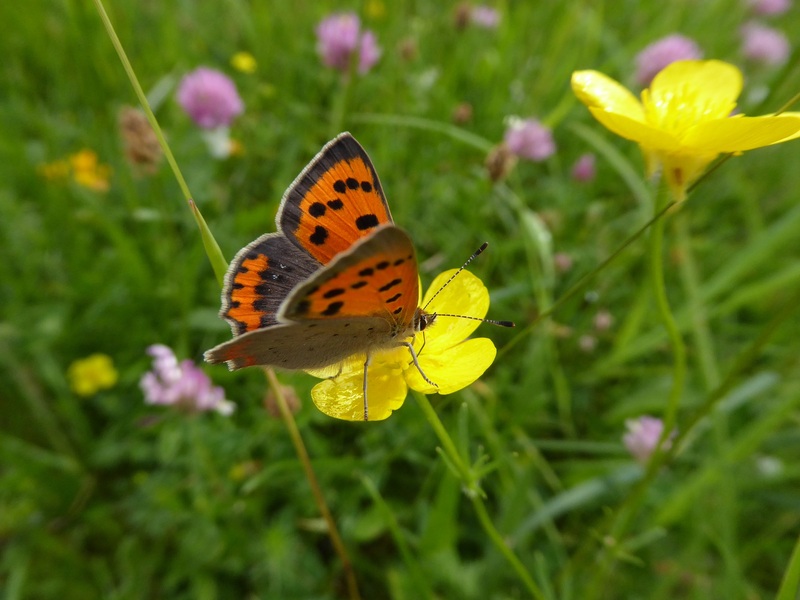 The Small Copper may also be found in the same habitats. 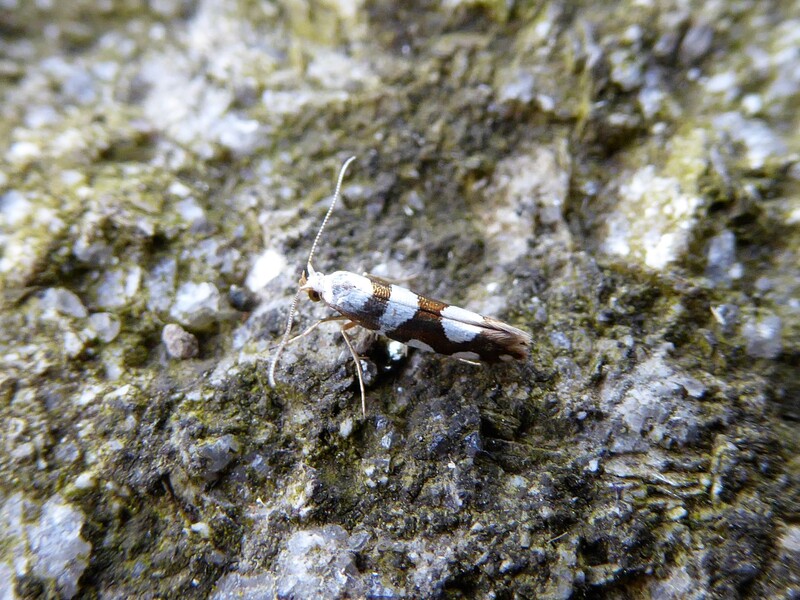 A highly distinctive moth both in the larval and adult states. Larvae feed communally on Groundsel and Common Ragwort, their yellow and black bands unmistakeable. Their bodies contain a cyanide compound derived from the host-plant and are avoided by birds. 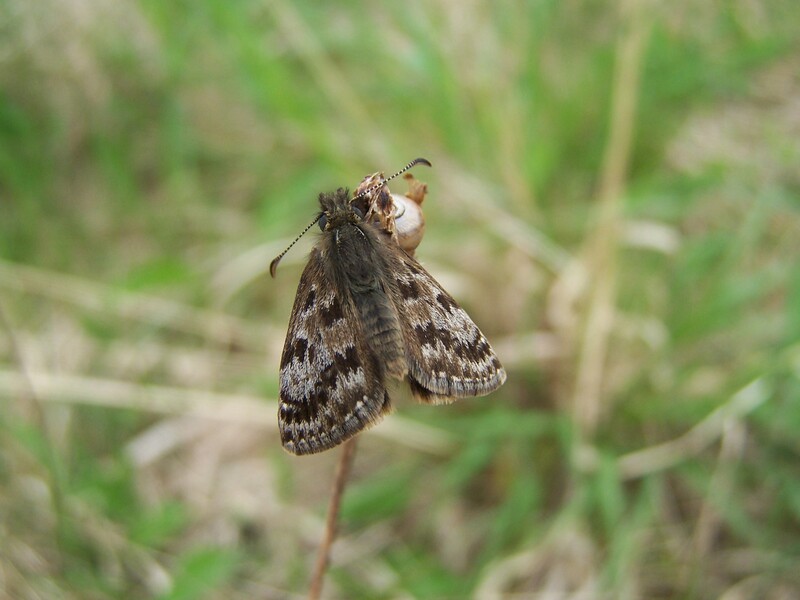 The moth is often abundant on vegetated sand dunes, quarries and weedy brownfield sites. While mainly a nocturnal moth, it frequently flies in the day. Its bright deep pink undersides are delightful to see in bright light, and children love their colours. However, handling it is not advised due to its toxicity. 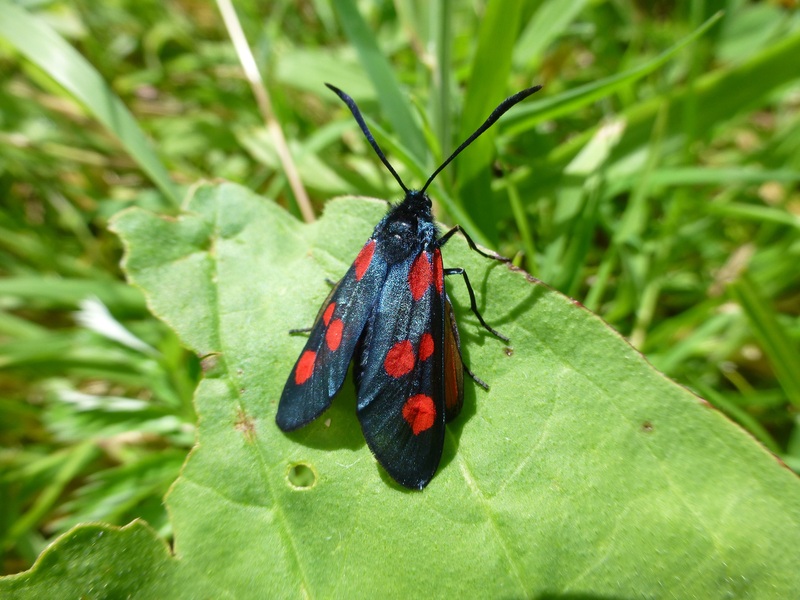 The Six-spot Burnet is a lovely moth that can be found in vast numbers on flower rich sand dunes where its larval host-plant, Common Bird’s-foot-trefoil is abundant. In some areas there may be thousands of these moths. They fly throughout the summer. 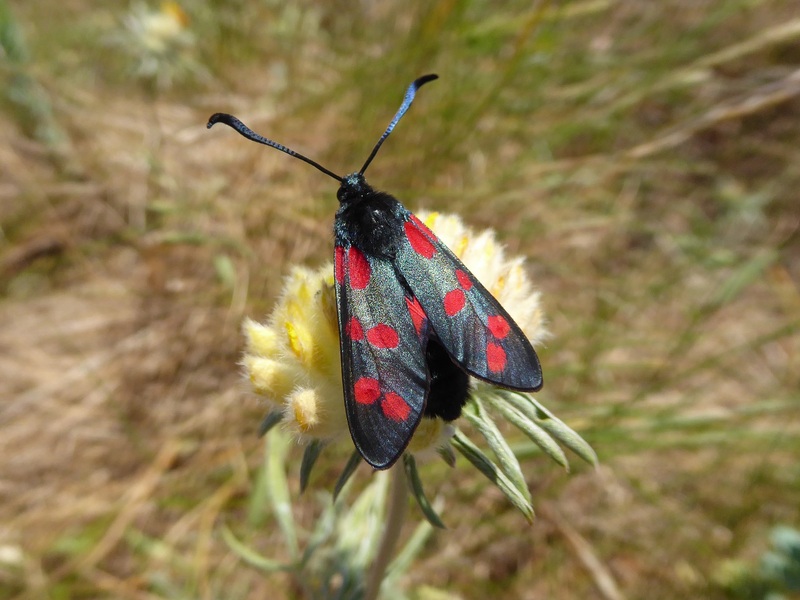 The Narrow-bordered Five-spot Burnet looks similar to the more common Six-spot Burnet and occur together on some inland sites but the Narrow-bordered Five-spot Burnet is much less common. 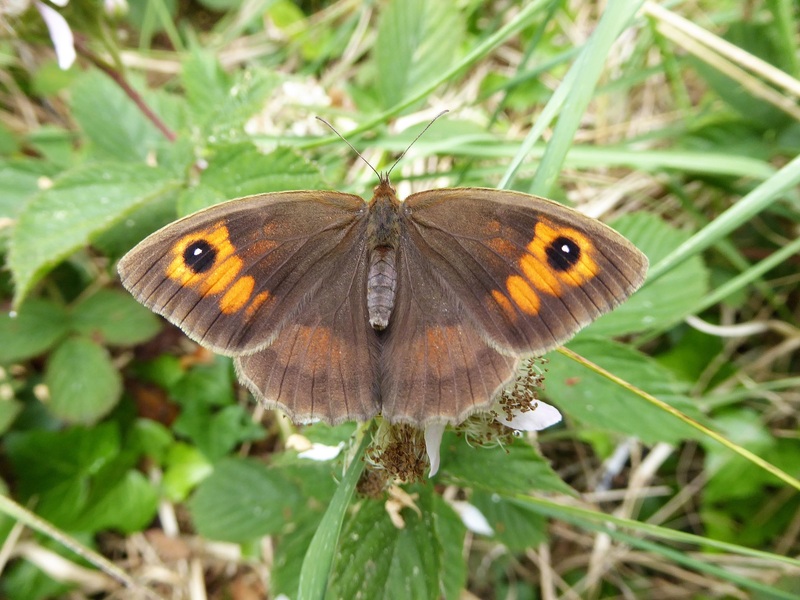 It was believed to be very rare but many populations have been found in the past five years, including on Butterfly Conservation Ireland’s Lullybeg Reserve. It looks slightly smaller than the Six-spot Burnet and the larvae feed on Meadow Vetchling. It seems to prefer moister habitats and flies in June and July. It visits flowers and flies in sunshine. 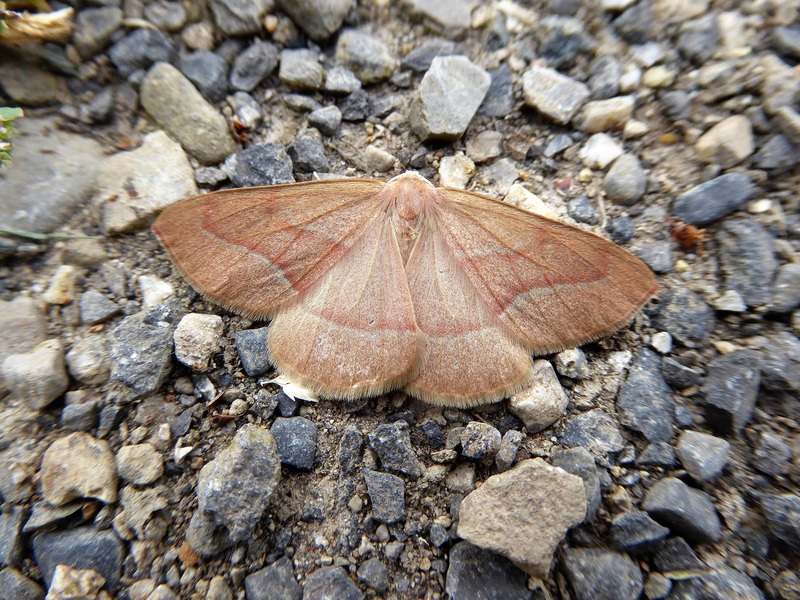 The moth that occurs in Ireland is subspecies insularis. We like to hear of moth records too, so please email your sightings to us, giving us the details as described under the Records Tab. In Ireland June is the first month of summer, according to meteorologists. It is the month with the longest days, the best plant growth, the month of orchids and the peak month for butterfly species. Only a handful of butterflies do not fly in June. 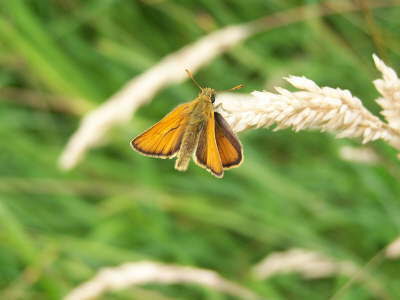 These are the Essex Skipper, Silver-washed Fritillary, Brown Hairstreak, Purple Hairstreak, Grayling and Hedge Brown. Every other species is on the wing and for some this month is their peak flight time. The species that are especially notable just now are the Wood White, Green Hairstreak, Small Blue, Marsh Fritillary and Large Heath. 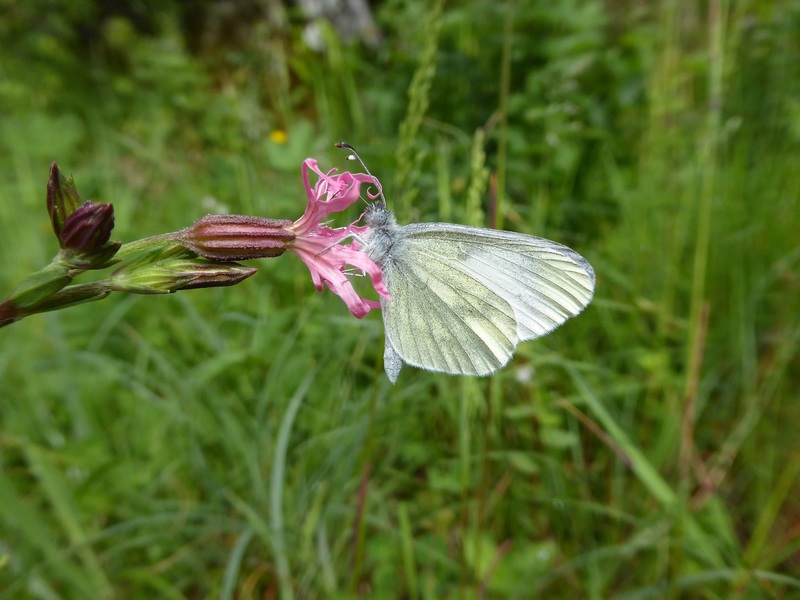 The Wood White, a rarity headquartered in The Burren in Counties Clare and Galway is a delicate-looking white butterfly, identical in appearance to its close relative, the Cryptic Wood White. Both are now very busy laying their eggs. 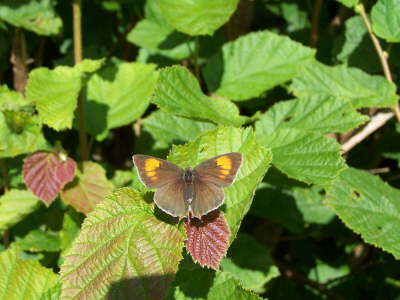 The butterfly may be seen in the hazel scrub in The Burren, fluttering delicately as it searches painstakingly for the correct vetches growing in the correct positions. Last Monday I watched a female take 20 minutes to find a vetch on which to lay a single egg. When it fluttered very low it was eyed eagerly by a young frog. 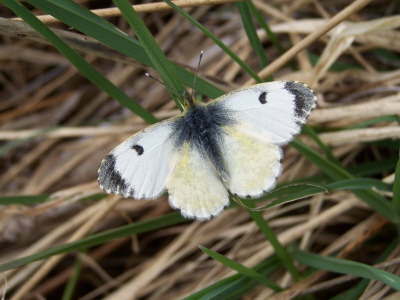 No wonder the Wood White is so rare! Below is a photograph of a male on Ragged Robin. The Green Hairstreak is one of our smallest and most easily overlooked yet beautiful butterfly, sporting in bright light a shining green reminiscent of a bejeweled rain forest butterfly. It is a species of damp scrub, typically at the edge of bogs where it feeds mainly, I suspect, on Bilberry. It does have several other larval food plants but Bilberry patches in sheltered areas are the most reliable places to look for it. Both sexes are fond of nectar, especially of the nectar of Bush Vetch. Agitate a tuft of flowering vetches, stand back and watch. 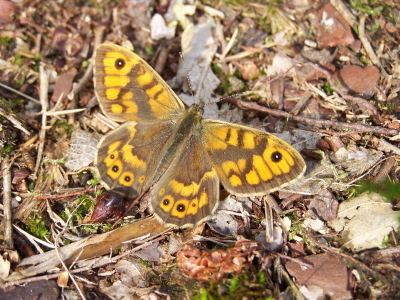 A shimmer of green and dark brown (the upper surfaces are brown but the butterfly always rests with closed wings, which are green) are vaguely glimpsed while the butterfly is airborne. When settled, approach carefully for a good view. As you see from the photograph, seeing it up close is a treat. 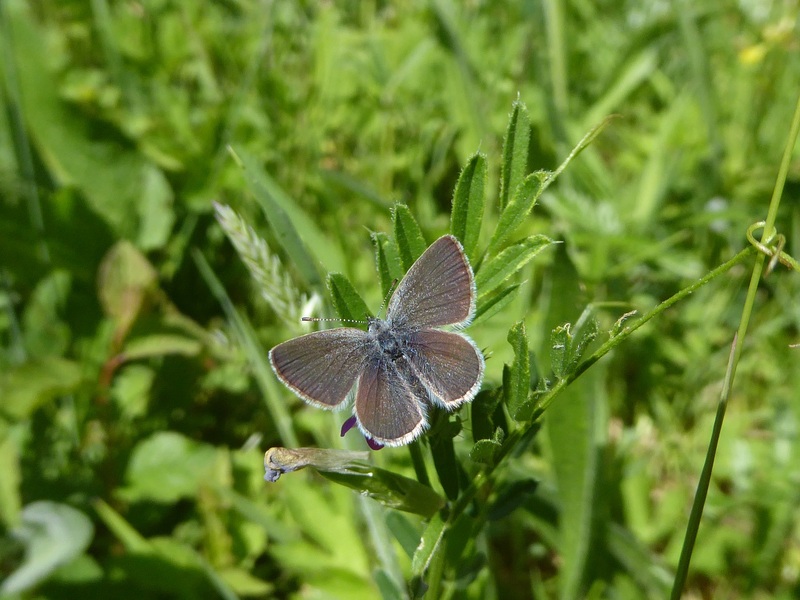 The Small Blue is described well by its adjective but poorly by its noun. It is certainly small, but is not blue. 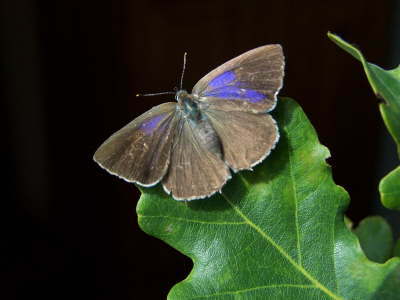 The male only has a dusting of blue scaling near the base of the upper surfaces of the wings, the iridescence giving the butterfly a bluer appearance in flight than the settled insect has. The species is endangered and has only one food plant. The food plant occurs only on calcareous soils. 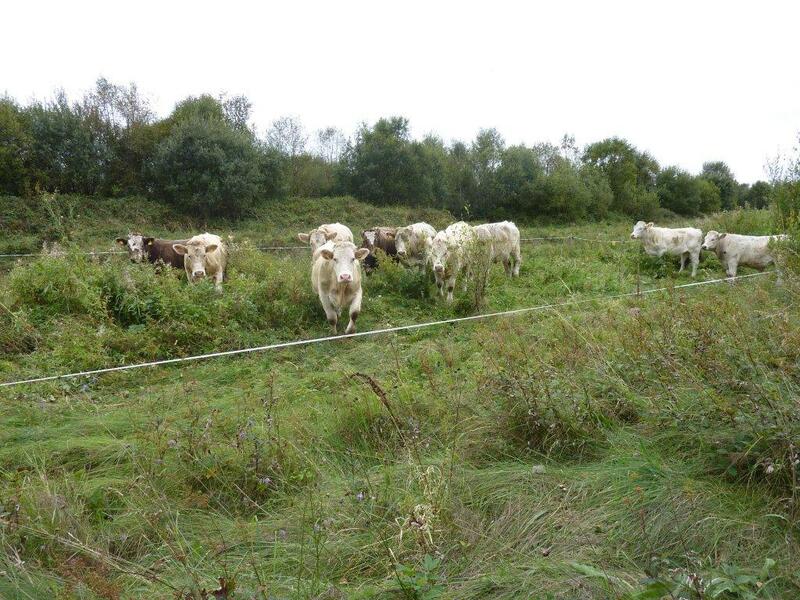 It cannot withstand heavy grazing by any animal or any sheep grazing and it cannot withstand encroachment by taller vegetation. 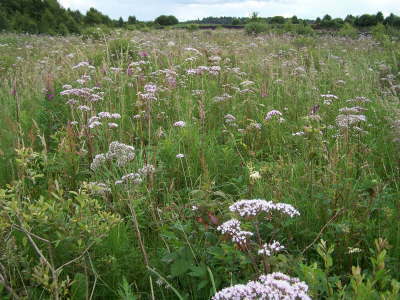 Strimming the habitat in June or July will wipe out the butterfly which feeds on the flowers only. This species is very easy to miss, but is a charming butterfly, always busy with living. By contrast, the Marsh Fritillary is lazy. The female is especially relaxed, and perches for long periods on a leaf in the grassland, apparently doing nothing. The males are much more active, zig-zagging over the grassland habitat but even the male will sit still, especially in the mornings when he basks to warm up. The Marsh Fritillary is a lovely butterfly and in the remarkable variety of its colouring, patterning and size, one of the most interesting, with no two ever alike. 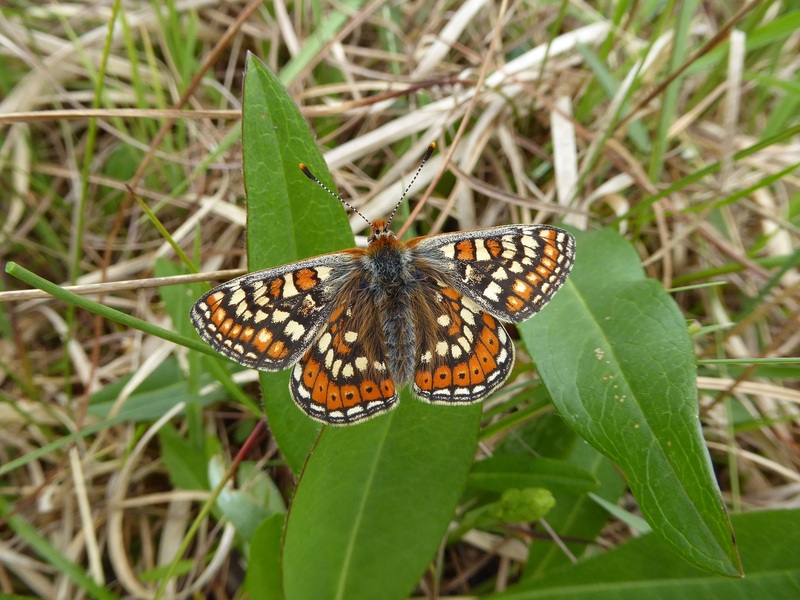 The Marsh Fritillary holds the distinction of being the only legally protected species of insect in Ireland, enjoying the protection of the Habitats’ Directive 1992. This means that certain areas have been designated as Special Areas of Conservation to protect it. It is a real delight to see a fresh individual and given the fact that it is very rare in many parts of Ireland, one to keep an eye on. Its habitat must be maintained if it is to continue to survive. The Large Heath will not win any design awards. It is one of our dowdier butterflies, with some specimens looking fairly grey on the wing but it is dying out with the annihilation of its wet bog habitat. 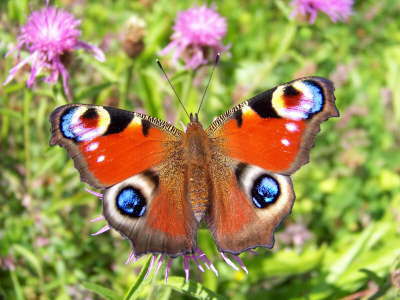 One of our most sensitive butterflies, it is in trouble here and in Europe. Because very few people tramp across the tricky ground of wet bogs, it is rarely recorded but it’s out now, so take a look at him while you still can. 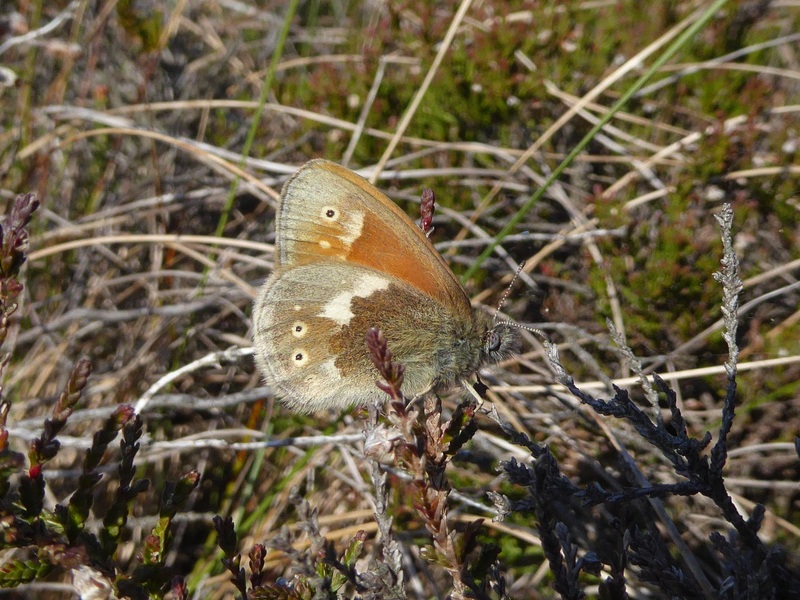 Think of this bog butterfly’s needs the next time you’re about to throw turf on the fire or garden using peat. 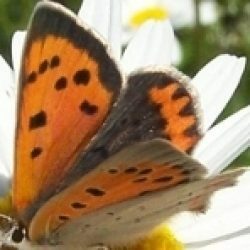 A final and really delightful butterfly is the Small Copper, aptly named. Rarely seen in number, it is a special experience to see a pristine example, like the females below, feeding on a buttercup. Enjoy the photographs, but get out in good habitats and look for the real thing! All photographs are © copyright J. Harding. Wood White on Ragged Robin. 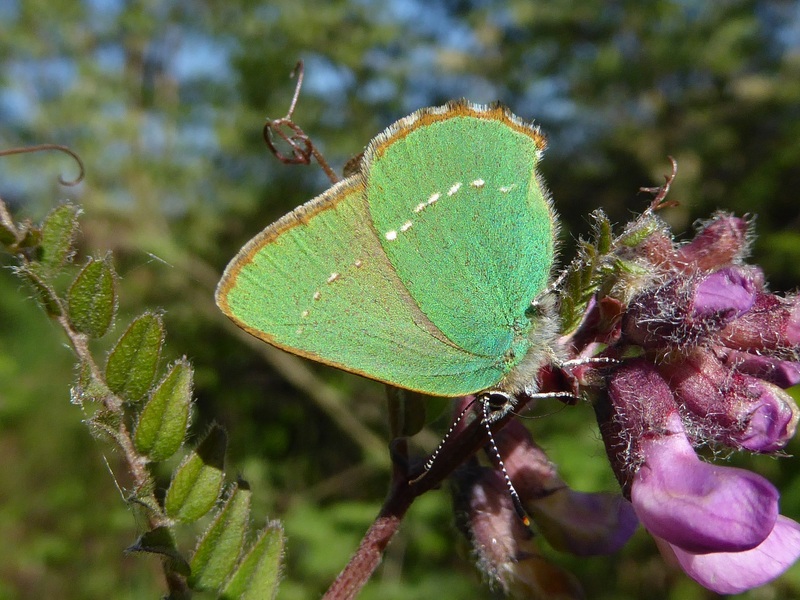 Green Hairstreak female on Bush Vetch. Large Heath male on bog habitat, its only home.